Eric teaching students at FareStart how to sew a pig stuffed pig.We are thrilled to participate in this year's Guest Chef Spectacular put on by FareStart. It's an amazing event where all the guest chefs of the last year put out 800 "tastes" for participants roaming around gorging themselves on delightfully prepared bites.It's also a fundraiser for this very important and awesome non-profit started in our town, but now being duplicated all over the country. We had a blast last September teaching students how to smoke a whole hog. Now we get to join some of the best chefs in Seattle for this special night.If you haven't bought tickets, do it! You get to eat til you bust for a great cause! That's a win-win in my book.Here is the flyer. For tickets click here. 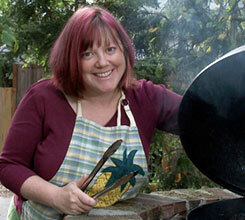 **Repost from 2012****My Valentine's Day post this year is featured on the Char-Broil Live site. The recipe is for Grilled Lamb Skewers with a Cabernet sauce, grilled Heart Pita (yes! ), and a Watercress, Grilled Onion, and Chevre Salad.Check out the full post. It was delicious. My kids and I gobbled it up and left nary a scrap for poor daddy.As you may recall, last year, in a near full-gale storm, I grilled Heart Burgers for my kids and had to give my grill some love first. In the rainy Pacific NW, it's important to grill year-round to combat moisture and mold in our grills. So go on. Get out there and grill your honey something special! My little DIY clip art. Here's, um, to simplicity.Happy New Year. I mean it. I wish all of you an amazing year. I've read many of my friends posts about kicking 2014 out with gusto, but I've got to say - 2014 was lovely for me. So much so that I simply wish 2015 to be a continuation of 2014, or the next phase of what was started in 2014.That means I'm...Writing more (working on polishing picture books and continuing to write my YA novel)Launching our second catering & wholesale brand (Fresh Betty, here she comes! 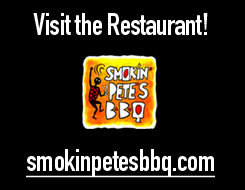 )Growing Smokin' Pete's BBQ catering (or in the case of 2014, keeping up with the growth) Hiring and training good staff to match the growth (training being my weakness, I intend to put more time and energy into this crucial part of owning a business)Working out a lot more (yes!) and eating mindfully (repeat after me: ribs are not a snack)That's a whole lot of more on my plate, a plate piled high and spilling over already. It means I have to make some concessions. I don't know if it's possible to do less housework. Not unless I want to start knitting dog hair sweaters, and, ew, no, but I won't feel guilty about hiring help in that department.I also am taking at least a year off from blogging for Char-broil. I've loved working with them - they really treat their bloggers well - but I fell behind on assignments, or was rushing to get them in on time - and that's not my usual modus operandi. I'll also be posting less on She-Smoke this year. Yeah, I know, if wasn't like I posted a ton last year, but I need my already too-spare writing time for fiction projects. I have some cookbook ideas simmering on the back burner (snort, giggle, slurp...mmmm, scribble, scribble, scribble), but this year is the year of the novel, (and picture books, and the poetry I write when I'm stuck on the first two).Hmmm, I didn't mean for this post to be a whole New Year's resolution thing, but the bulleted list really makes it official. Hello 2015. And so, to circle somewhat forcefully back to the title of this post, when I'm quiet, it means I'm working on good things.May your year be filled with good things too. Those meaty but boneless "Country-style ribs" they sell in the grocery store may not be ribs, but they are tasty. They are also tough as shoe leather unless you cook them right. That's because the meat is cut from the same section we make pulled pork out of - the shoulder. That requires some slow and low cooking to tender up those tendons.If you only cook with gas, have no fear. We can make those meaty strips tender and delicious, and even smoky using the equipment you have.Amateurs put too much emphasis on the equipment. I can make great freakin' barbecue with some sticks and a dirt hole, people, so don't let anyone say you can't do this or can't do that just because you don't have a three thousand dollar smoker/grill system. Those are the same people that say their sauce is a secret recipe, or that give you their ten ingredient rub recipe. Pfft! I say. Unnecessary fuss.They'd probably turn their nose up on country-style ribs too, those naysayers, but I'm here to tell you, them meaty rib shaped meat strips is some tasty dinner. Easy too.Yeah, I know. I'm from Seattle, and North Seattle at that where we militant hippies chat about things like urban chicken coops and compostable hemp stationary. So that Billy Bob Kentucky back woods bit was totally fake, but not untrue. Eh-huh.How about instead of me blathering in assorted accents (I say, rawther get on with it! ), I just give y'all the recipe, huh? Read the full post here! You can thank me later. Yep, I can see the logo is truncated.It's probably to stop people like mefrom posting their logo on their blogs.What a great way to end the summer - smoking a whole hog at Fare Start. Eric and I get to teach pig prep the day before, then work with students to cook, present and serve a 3-course meal to all that are attending.We hope all of you will come because we are going to make a whole mess of delicious barbecue that you won't want to miss. And it's only $29.95 for dinner. And it all goes back into the non-profit job training program, so you get to feel totally smug and self righteous whilst chowing down on some seriously tender pork.Like it or love it. Dessert is provided by Ala Mode Pies, so total double rainbow people!In case you live far away, or live under a rock in Seattle, read about what Fare Start is all about, guest chef night, and our menu for the night.Be there. My mother-in-law will be there so, um, give us a good turn out, okay? It's your last chance to grill before school starts! Well, some of you in other parts of the country have already started school, but Labor Day weekend does serve as the other pillar to Memorial Day that means summer is over, fall shall begin.Here is a post I wrote for Char-broil. It's a recipe for grilled chicken with my secret to sneaking vegetables to my kids without their knowing it. Spoiler alert: I wait till they are so weak with hunger they'll eat anything I put in front of them. No, not really. To find out you'll just have to read the whole post here.If you feel more like steak this weekend, you should read How to Make Perfect Sear Marks. In that post there is a contest to win a jar of pickles. I know that's not an Ipad or Ipod or I-something, but they are really great pickles, if I may be so bold. We all love those perfect crosshatch marks on our steaks It's macho, so they say, but as a woman griller, I'd like to call it Facho (that's the feminine of, um, acho? )Anyhoo, it's not that hard. Don't let those boys tell you differently or that you need a pair of not-to-be-named body parts we gals don't have. Yes I've actually been told that. To my face. It's a wonder I didn't lash out. Oh right, I totally did. That was quite a hospital bill. No, just kidding. At least I think so. Sometimes my dreams are really really vivid....Here is the totally FACHO way to get perfect sear marks. It's a post I did for Char-broil so you'll have to click here to read it. This is what is called a teaser. But do click on it. I'm happy with the post and I did part of it in California and part of it in Seattle. Can you guess what photos are from where? First one to get it right gets a jar of pickles mailed to them in the fall. Seriously.This post just turned into a contest without my even planning it. It's like my fingers are possessed. Or my brain is simply way behind because we're experiencing our busiest catering season ever and I'm so bleary eyed that my hands are now in charge. They certainly have been reaching for a lot of chocolate lately with little to no resistance from my brain. Those hands.So go read the post and comment on the Char-broil post or here which photo you think was taken in California. Hint: You may want to read the post I wrote while in California. Certain people are excluded. You know who you are.